In 1979, Phạm Tuân, a Vietnamese fighter pilot, went into orbit with the Russian cosmonaut Victor Gorbatko as the first Asian in space as part of the Soviet Intercosmos Program, a political project of “friendship diplomacy” to connect the newly-formed communist governments. In the same year, thousands left Vietnam after the war to escape persecution from the new communist government. Many landed in the commune of Ivry-sur-Seine, a banlieue on the outskirts of Paris that hosts one of the highest concentrations of Vietnamese in France, most settling as refugees from the Vietnam War. This urban landscape serves as the backdrop of Hương Ngô’s exhibition at 4th Ward Project Space, In the Shadow of the Future. 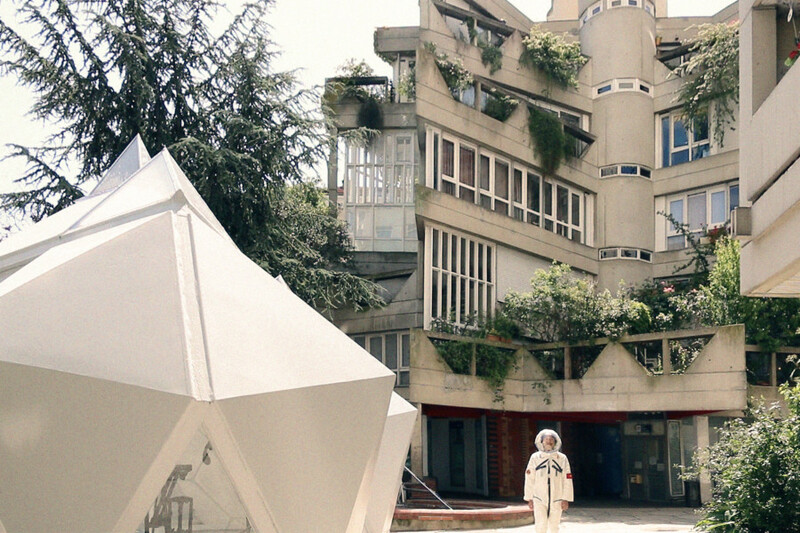 Begun in 2014, Ngô worked with members of the Vietnamese community in Paris to create a multi-channel video installation based on the character of Phạm Tuân, who quietly haunts these remnants of futuristic housing projects – many named after communist heroes – aged architectural stand-ins for political ideals transported and still nurtured by inhabitants of this communist stronghold today. Pointing to this moment in time and the cultural artifacts that remain, Ngô interrogates how questions of coexistence – on both global and local levels – might reclaim currency and expansive potential in our current moment. Image: Hương Ngô, In the Shadow of the Future (Video Still), In collaboration with l’Union des Jeunes Vietnamiens de France (UJVF) and l’Union Générale des Vietnamiens de France (UGVF), Performer: Lương Nguyễn Liêm Bình, 2014–2019.